Manuela Zanvettori is one of Murano’s most extraordinary glass artists. She specializes in the high art of jewellery making and understands her craft like hardly anyone else. She makes every necklace, earring or ring with much love for the detail by hand. Manuela’s masterpieces are an ode to the wearer of jewellery: Her jewellery combines timeless elegance with classic charm, every piece captures the picturesque scenery of Venice and immortalizes it in glass. 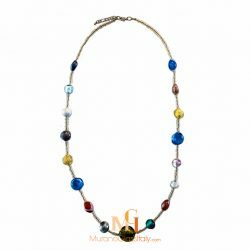 Since her earliest childhood on Murano, Manuela has been enthusiastic about the glass and its endless variety. The artistic and creative process of shaping and taming the raw glass mass represents the transformation of imagination and inspiration into a unique piece of jewellery. Each piece has what it takes become your new favourite piece.